Twisted Oak Tavern was established in 2015, with the vision of providing a modern twist on the traditional tavern. A great selection of craft beer. With over 30 beers on tap, we serve beers from craft brewers along with beers from our own brewery producing craft beers on site. A full bar serving unique cocktails and classic favorites. We feature craft spirits made by local distillers. A scratch kitchen serving quality classic tavern fare prepared with locally-sourced ingredients. A great happy hour menu served 7 days a week. Room for large groups to gather to socialize and celebrate. 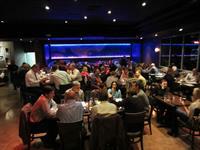 We welcome large groups from corporate mixers and rehearsal dinners to after work meetups. TVs showing the biggest sports events of the day. Does this make us a sports bar? Some would say so. We believe a tavern should be place to gather with friends and watch the big game. Voted 2016 Best Beer Bar In California by craftbeer.com!